Back to business, after a short break, and yes, TGIFs are in order. 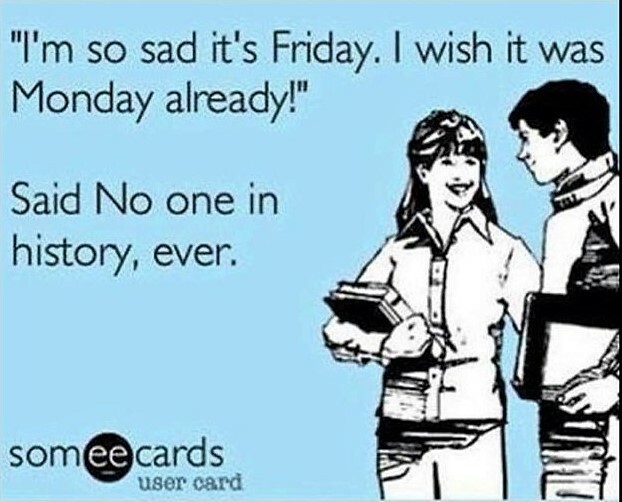 For example, TGIF to the Congressional Republicans who decided a partisan junket to Russia would be a great way to celebrate American Independence. Who better to share a hot dog with than representatives of the country that interfered in our presidential election, right? At least, that's what we can guess Senators Richard Shelby (AL) Steve Daines (MT), John Hoeven (ND), Ron Johnson (WI), John Kennedy (LA) Jerry Moran (KS), John Thune (SD) and Representative Kay Granger (TX) must have been thinking. And if you're going to do that, I guess it's better to go it alone than expect bipartisan appreciation for the mission. And what exactly was the mission? From an article in the Washington Post, we learn it was important stuff, for sure. Members of delegation set off on their trip late last week promising to be tough with Russian officials ahead of the president's visit, especially on matters of election interference. But they struck a conciliatory tone once there: the point of their visit, Shelby stressed to the Duma leader, was to "strive for a better relationship" with Moscow, not "accuse Russia of this or that or so forth." My first thought was holy crap, this had to be a joke; my second thought was was that there must not be fireworks available in the states these folks represent. 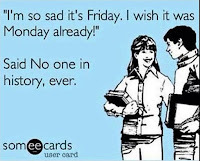 Speaking of fireworks, I'm thinking Scott Pruitt's probably thinking TGIF. He may have set a record for the greatest number of ethics investigations against an administration official ever, which would surely be a feather in the cap of the most superlativest president ever. Birds of a feather or something. Perhaps the only thing more impressive than the lack of ethics of the former EPA administrator was his resignation letter - a doozy, for sure. There's a great commented version here, if you like; I'm just going to try and play it straight, I promise. I mean, I promise I'll try. Mr. president, it has been an honor to serve you in the Cabinet as Administrator of the EPA. Truly, your confidence in me has blessed me personally and enabled me to advance your agenda beyond what anyone anticipated at the beginning of your Administration. Your courage, steadfastness and resolute commitment to get results for the American people both with regard to improved environmental outcomes as well as historical regulatory reform, is in fact occurring at an unprecedented pace and I thank you for the opportunity to serve you and the American people in helping achieve those ends. Damn, that's a hell of a resignation letter right there, isn't it? He coulda stopped, but no-o-o-o. Pruitt had to keep going. That is why it is hard for me to advise you I am stepping down as Administrator of the EPA effective as of July 6. It is extremely difficult for me to cease serving you in this role first because I count it a blessing to be serving you in any capacity but also because of the transformative work that is occurring. Kinda like the graduation speech that has three or four or five natural endings, so too did Pruitt's letter. But first, let's get this next part out of the way. Oh for Pete's sake, pull up your tactical pants and get over your bad self, will you? But wait -- there's MORE! My desire in service to you has always been to bless you as you make important decisions for the American people. I believe you are serving as president today because of God's providence. I believe that same providence brought me into your service. I pray as I have served you that I have blessed you and enabled you to effectively lead the American people. Thank you again Mr. president for the honor of serving you and I wish you Godspeed in all that you put your hand to. 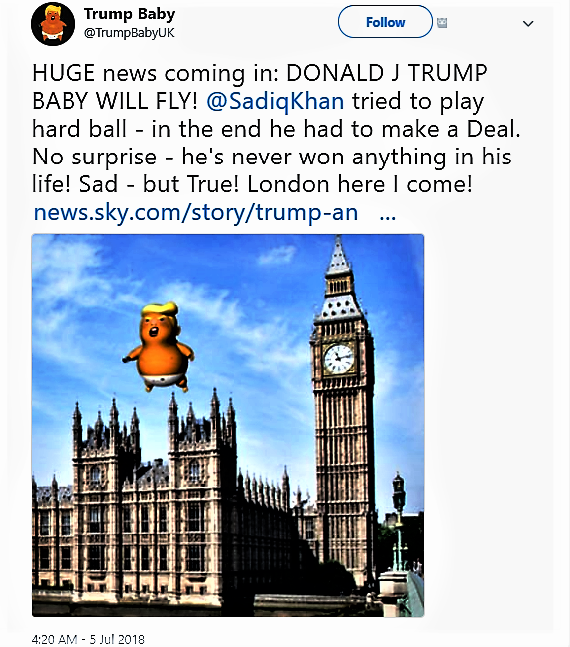 And finally, speaking of wow, the Trump Baby will fly over London when the president visits later this month. What is the Trump Baby, you ask? 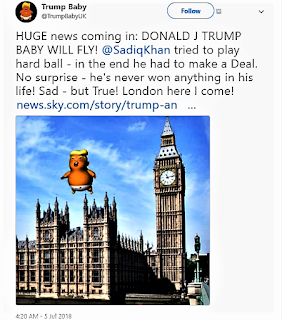 The Trump Baby blimp is nearly 20 feel tall, wearing nothing but a diaper, and a grimace. A tuft of yellow hair tops his orange head. He is armed with a cellphone, ready to tweet. And, he has a Twitter account.